The Red River colony was established in 1811 by Lord Selkirk, who purchased the land from HBC thanks to his clout as the Company’s largest shareholder. But its location, straddling the North West Company’s main route from the Lakehead to the Athabaska, could not help but provoke confrontation between the two trading entities. Compounding the situation was the presence of a large Métis community which worked for both companies and was opposed to the colony for fear of the displacement of the buffalo on which they relied. 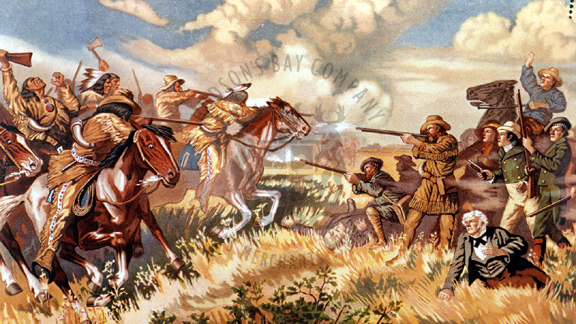 In the summer of 1816 Red River Colony Governor Robert Semple and twenty others were slain at the Battle of Seven Oaks after a confrontation with Métis leader Cuthbert Grant and his men. This event, often considered the birth of the Métis nation, fanned the flames of the HBC-NWC rivalry which persisted until the two merged in 1821.